One of the major global challenges facing contemporary built environments is the future of rural development. In China, rural regions have become a new space for experiments. This creates a new countryside at a speed and scale unseen in the Western world. Drawn by the promise of boundless opportunity, architects, planners as well as capital flow are converging in rural regions across the nation. 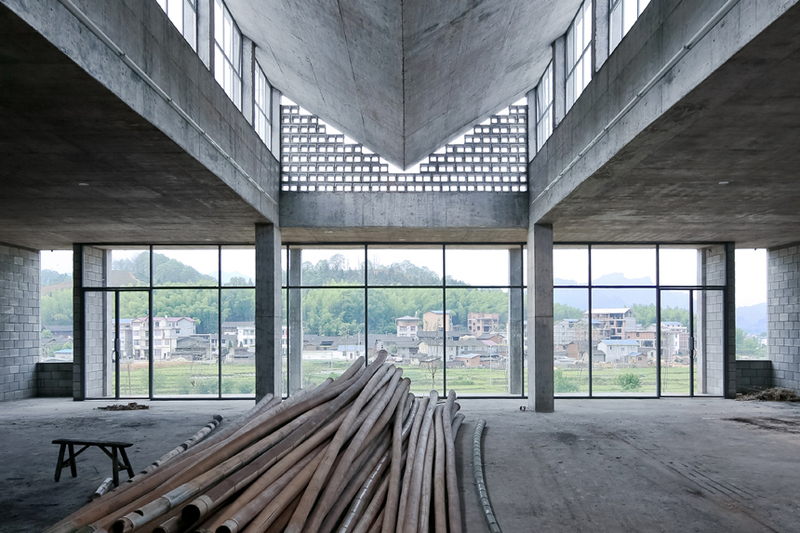 With projects related to housing, local production, cultural practices, agricultural tourism, and revitalisation of communities, the exhibition depicts a panorama of the contemporary Chinese countryside. By outlining a prospect with opportunities and anticipating future development, the presented insights offer a rich source of ideas, strategies, and knowledge. The exhibition is embedded in the long-term programme ‘Regions on the Rise’ by ANCB The Aedes Metropolitan Laboratory. The return to pastoral life has long been an ideal of Chinese literary tradition. In modern times, the development of rural living typically involves aspects such as policy, capital, infrastructure, and technology. While modernisation and technological progress promise better lives, they also, to some extent, sever the link between rural life and tradition. Faced with mass-produced rural housing brought on by urbanisation, architects attempt to find a balance between tradition and modernisation, taking advantage of new technology in search of a vernacular connection. From the great yellow expanse of the Loess Plateau to the water towns south of the Yangtze, from the vast and abundant plains of northeast China to the green and beautiful farmlands of the south, hundreds and thousands of villages have become sites for industrial development, self-building, and cultural creation. These sites enjoy tremendous opportunities offered by innovative concepts, the Internet, logistics systems, and sharing economies. The exhibition features 22 architectural best practice examples, including projects on housing, production and education, culture and tourism, health and leisure. These illustrate the breadth of innovative approaches to improving rural environments, both on a small and a large scale. Among the architects are Atelier Archmixing, Atelier Deshaus, Chen Haoru, Drawing Architecture Studio, Fu Xiaohui, Hua Li (Trace Architecture Office), Landshine Design Alliance, Naturalbuild, Philip. F. Yuan, Rural Urban Framework (RUF), Vector Architects, Zhang Haiao, Zhang Lei (AZL), Zhang Li (Atelier TeamMinus), Zhao Yang (Zhaoyang Architects) and Zhu Jingxiang. ‘Building a Future Countryside in China’ was already the Chinese contribution at the 16th International Exhibition La Biennale di Venezia in 2018. The exhibition at Aedes Architecture Forum will be shown in the context of ‘Regions on the Rise. Rethinking Strategies for Rural Development’, an interdisciplinary long-term programme on new concepts for rural space by ANCB The Aedes Metropolitan Laboratory.